Originally drank on October 15th, 2013. When my friend Claire recently went to Ireland, she knew I was a fan of BrewDog beers and she grabbed me a pair of them. One I had and one that I hadn't. Since it had been over two years since I drank this beer, I thought I would start up a "revisited" series for some of these special beers that I get my hands on. So, it looks like my original feelings are still in tact. And drinking it in the new IPA glass didn't seem to make it any different. It's got some good flavors. It's a little thicker than an IPA but has less bitterness and dry-mouth taste. 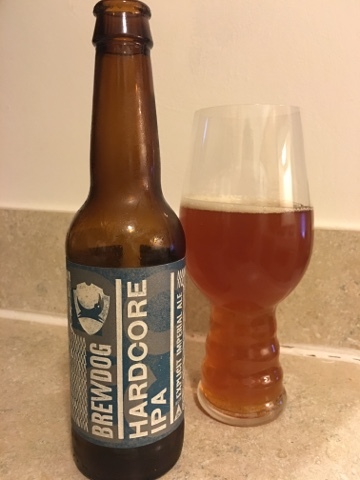 It's not my favorite BrewDog offering, but as I said before, I can drink one with no problem and enjoy the quality.